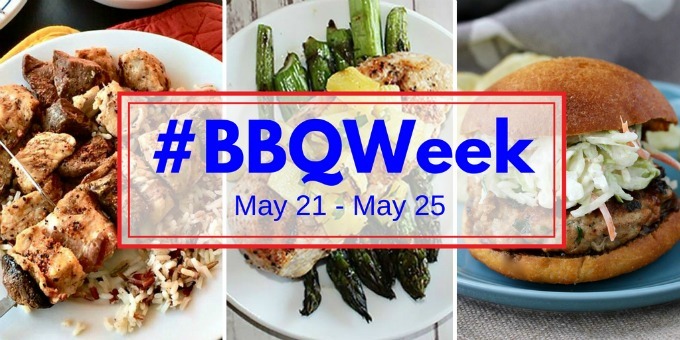 It’s day 3 of #BBQWeek hosted by Ellen of Family Around the Table and Christie of A Kitchen Hoor’s Adventures. If you haven’t checked in with me yet, this week is full of recipes made for grilling or for BBQ’s. 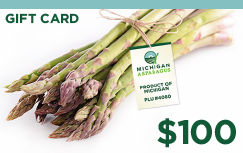 Over 20 bloggers are participating in this event this week and we have some great sponsors that have put together an awesome giveaway that you can win. One of the sponsors is Not Ketchup. I’ve worked with them a few times before and have tried out most of their sauces. 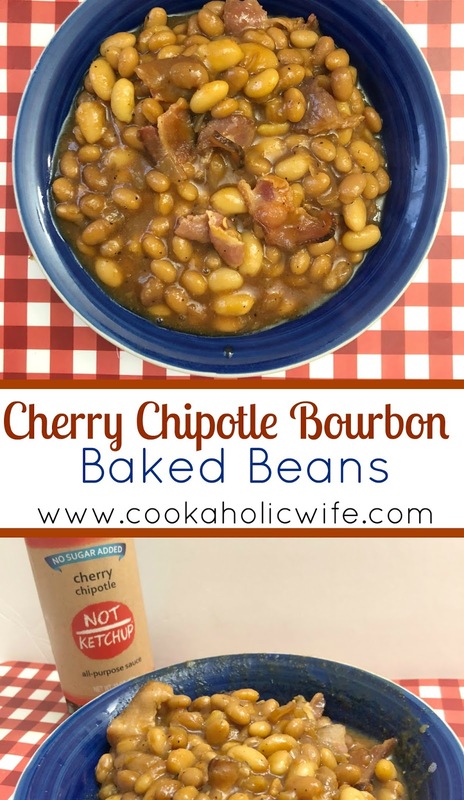 They’re all delicious but for this recipe I decided to go with the Cherry Chipotle All Purpose Sauce. When I was looking for recipes for the event, I realized that I’d never made baked beans before. I wasn’t a huge fan of them as a child and we didn’t have them very often at parties or BBQ’s so I guess I just never thought to make them. I still remember the first time I had them and realized how good they were. It was a potluck work event and the wife of a coworker had made them. 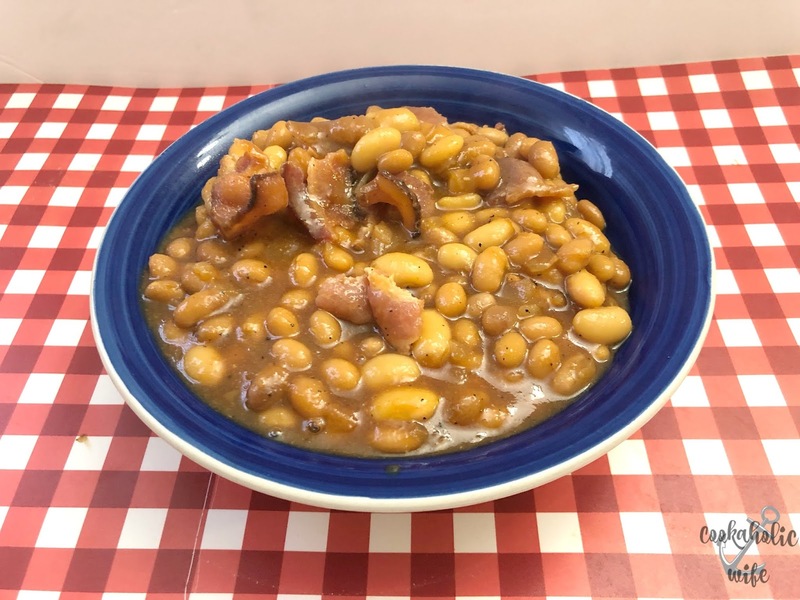 It’s probably been at least a decade since then, but every time I see homemade baked beans, that’s what I think of. 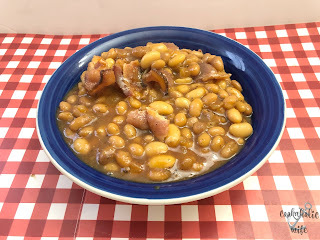 You can make homemade baked beans using dried beans that have been soaked, but I wasn’t feeling that ambitious so I opted to used canned beans that had been drained. Rich and smokey, this cherry chipotle sauce pairs wonderfully with baked beans. 1. Cook the bacon in a skillet over medium high heat until crispy. Remove from the skillet and place on a paper towel to absorb excess grease. 2. Reserve a teaspoon of the bacon grease and add the onion to the skillet, cooking over medium-low heat for 3-4 minutes. 3. 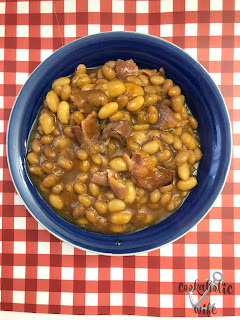 Add onions, beans, Cherry Chipotle Sauce, mustard, bourbon, Worcestershire sauce, salt, pepper, and garlic powder to a slow cooker. Stir until combined. 5. Stir in the bacon before serving. These are delicious! The beans are perfectly tender and the cherry chipotle provides just enough heat and sweet to the beans. I bet this ketchup makes your beans taste fantastic! What a fun way to use Not Ketchup! 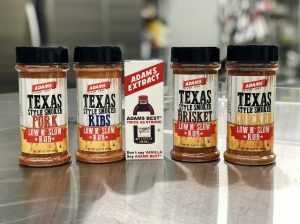 And this is such a great side for BBQ season. Definitely need to look into some other flavors of Not Ketchup, we love the Tangerine Hatch Chile! These beans look so good! After trying this sauce, I can just imagine how well it works in these beans…thank goodness I have a little bit left! Such a creative use for the Not Ketchup. 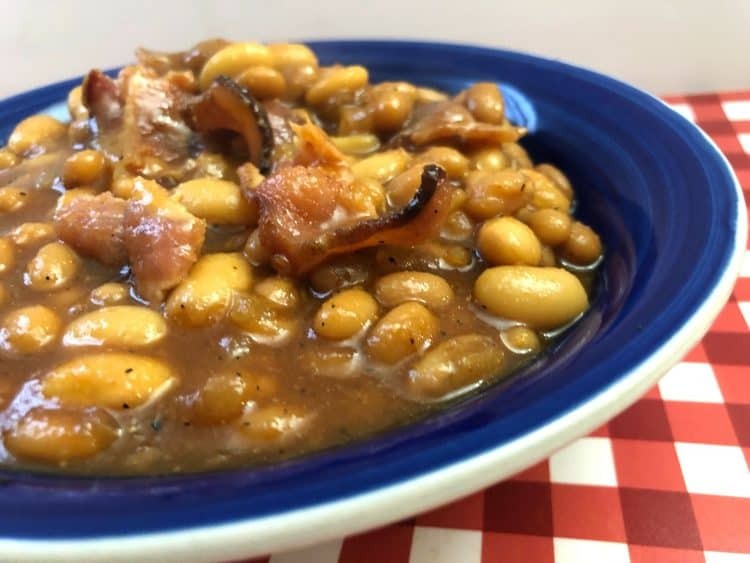 I bet the beans are awesome and the perfect side for any cookout. Oh yum! 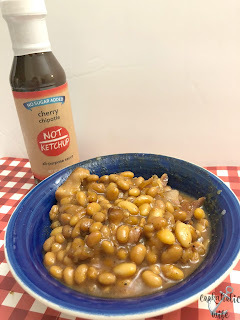 I love the idea of using the Not Ketchup to add flavor to already delicious baked beans!! YUM!